Watch a video of AIM GinkoSense? The nervous system controls communication in the body. Its leader is the brain, which allows us to think, decide, control our actions, and coordinate the ability to move, touch, smell, hear, and see. Like any body system, good nutrition plays an important part in seeing that the good health of the nervous system is maintained. AIMGinkgoSense? helps maintain your neuro health, especially in regard to memory, concentration, and vision. 120 mg of ginkgo biloba extract standardized to contain 24 percent ginkgoflavonglycosides and 6 percent terpene lactones?the same percentages used in clinical trials. Close tightly after opening and store in a cool, dry, dark place (70-75 ?F; 20.1-23.8 ?C). Do not refrigerate. Anyone concerned with mental acuity and vision as they age and with maintaining their overall neurological health should consider using AIMGinkgoSense? Is there anyone who should not use AIMGinkgoSense? 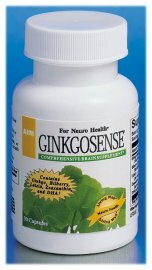 Pregnant and nursing women and children should not take AIMGinkgoSense? Can I take AIMGinkgoSense? with other supplements or medications? Those taking anti-clotting medication, such as Coumadin?, or using aspirin for this purpose should consult a health practitioner. You may take AIMGinkgoSense? with other products. When we think of aging, we think of the obvious?wrinkles and achy joints, for example. We usually don?t consider things such as worsening vision or memory loss until we are well on our way to senior status. But we should. After all, the disorders that may go along with the aging of the nervous system are some of the most frightening problems we face?dementia, Alzheimer?s disease, and macular degeneration, for example. However, there is a way to fight this ?neuro aging.? Through the use of dietary supplements. DHA (docosahexaenoic acid) is an essential fatty acid (EFA). EFAs are called ?essential? because very little can be synthesized by the body?we must obtain them from our diet. DHA is one of the omega-3 fatty acids, whose perhaps best-known source is fish oil. EFAs are necessary for good health, and DHA is well-known as one of the keys to a healthy nervous system. DHA is the building block of human brain tissue?60 percent of the brain is fat, and DHA is the most abundant fat in the brain, as well as in the retina of the eye. DHA is essential in communication between the brain and nervous system?it plays a role in the cell membrane, where the electrical impulses that are the basis of communication within the nervous system are generated. Without DHA and other fatty acids, communication within this system can break down or become less effective. The importance of DHA to the brain and nervous system is seen early in our development. In the first few weeks of embryonic development, the mother?s blood supplies the fetus with large amounts of DHA. In the last trimester of a pregnancy, the DHA content of the brain?s cerebrum and cerebellum?which contains centers for speech and abstract thought?increases threefold. DHA supplementation may be especially important as we grow older. The body?s ability to synthesize DHA, which is limited in all people, may decline even further with age. This is compounded by the small amounts of DHA we get in our diet, especially those who strive for a vegetarian diet?the richest sources of DHA are red meats, animal organs, and eggs. A study published in the American Journal of Clinical Nutrition (62 (July 1995): 1-9) presents research indicating that omega-3 fatty acids, specifically DHA, may reduce the risk of depression. The authors associate the increase in depression in North America in the past century with the decline in consumption of DHA during the same period. To lend support to this idea, the authors also note that there are lower rates of major depression in those societies that consume large amounts of fish, a key dietary source of DHA, are consumed. DHA is also being considered as a factor in dementia and Alzheimer?s disease. In 1997, a link between low levels of DHA and Alzheimer?s disease and memory loss was the subject of a conference at the New York Hospital?Cornell Medical Center?s Nutrition Information Center. Among the finding discussed at the conference was that a low level of DHA is a significant risk factor for dementia, including Alzheimer?s disease. In a recent study looking at fish oil, which contains DHA, and macular degeneration, researchers found that more frequent consumption of fish appeared to protect against late age-related macular degeneration. Only a moderate intake of fish was necessary for the protective effect (Archives of Ophthalmology 118 (March 2000): 401-404). There have been very few studies conducted on bilberry since the 1960s and more current studies are needed to confirm bilberry?s properties. Lutein and zeaxanthin, carotenoids found in green, leafy vegetables, are also good for the eyes. Like other carotenoids, they are antioxidants. What is unique about these two is that they are the only carotenoids found in the eyes?in the macula (the part of the retina responsible for detailed vision) and the lens. Current research is investigating what function they may serve, and recent studies have found that diets rich in lutein and zeaxanthin may play a role in reducing the risk of age-related macular degeneration and cataracts?two problems that are usually a result of the aging process. Those with the greatest risk for AMD tend to have a lower amount of lutein and zeaxanthin in the eyes than those without AMD. In the mid-1990s, one large epidemiological study (a study that looks at a population and charts its general risk) reported that increased consumption of lutein and zeaxanthin reduces the risk of AMD (JAMA 272, no. 18 (1994): 1,410-23). A study published in November 2000 supports this. In this 140-day study, it was shown that lutein supplementation increases macular pigment?this is important because macular pigment may protect against AMD (Investigative Ophthalmology and Visual Science 41 (November 2000): 3,322-26). This is further confirmed in a report that notes in the abstract that ?Some observational studies have shown that generous intakes of lutein and zeaxanthin, particularly from certain xanthophyll-rich foods like spinach, broccoli, and eggs, are associated with a significant reduction in the risk for cataract (up to 20 percent) and for age-related macular degeneration (up to 40 percent).? The author goes on to note that further research is necessary (J Am Coll Nutr 5 Suppl (October 19, 2000): 522S-527S). There have been three epidemiological studies looking at the correlation between dietary lutein and zeaxanthin and the risk of cataracts. These found a trend toward reduced risk of cataracts and cataract surgery with increased intake of lutein and zeaxanthin (Am J Clin Nut 70, no. 4 (1999): 517-24; Am J Epidemiol 149, no. 9: 801-9; Optom Vis Sce 77: 499-504). They absorb near-to-UV blue light, and this type of light is potentially the most damaging light that reaches the retina. As antioxidants, they inhibit the formation of free radicals?this is important because the eye is rich in fatty acids that are easily attacked and damaged by free radicals. Ginkgo biloba extract (GBE) has been studied since the 1950s, and studies reveal positive results for what is known as ?cerebral insufficiency? : a collection of symptoms that include difficulties in concentration and memory, absentmindedness, confusion, lack of energy, tiredness, decreased physical performance, depressive mood, anxiety, dizziness, tinnitus, and headache. The German Commission E?a group of physicians, pharmacists, and toxicologist who evaluate herbs for safety and efficacy?notes that GBE does lead to an improvement in memory performance and learning capacity. This is largely due to its effect on circulation. Ginkgo increases blood flow to the extremities and the brain?there is actually an increase in cerebral blood flow. It stands to reason that if you get an increase of blood flow to the brain, the brain is going to get more oxygen and more glucose. It is this increased flow of oxygen and nutrients that is the reason why there is significant improvement in patients with some form of dementia. Since October 1997, when the prestigious Journal of the American Medical Association (JAMA) reported that GBE may be beneficial in the treatment of Alzheimer?s disease, Ginkgo has received increased attention. In 1998 and 1999, analyses of previous ginkgo studies noted that ginkgo does positively affect cognitive functions to some degree. A more recent study (Dement Geriatr Cogn Disord 11, no. 4 (July-August): 230-7), looked at ginkgo and dementia in a 26-week, double-blind, placebo-controlled trial. The abstract notes that ?In comparison to the baseline values, the placebo group showed a statistically significant worsening in all domains of assessment, while the group receiving GBE was considered slightly improved on the cognitive assessment and the daily living and social behavior.? Murray, Frank. Ginkgo Biloba. New Canaan, CT: Keats Publishing, Inc., 1996. Gormley, James J. DHA, A Good Fat: Essential for Life. New York: Kensington Publishing, 1999. AIMGinkgoSense? is a Neuro Health product. The comlete Neuro Health line consists of AIMGinkgoSense?, AIMKavaMist?, and AIMComposure?. Use these products to help yourself maintain neurological health.